Cuban-born New Yorker Narciso Rodriguez cites a plethora of references when discussing his main influences. From the sleek lines of New York architecture to the colour and vivacity of Latin America, Narciso’s vision of femininity is an adoration of classicism and timelessness. This vision is reflected in For Her, Narciso’s first fragrance for women. The voluptuous yet refined scent sweeps in waves of flora, amber and woods, with a signature musky heart. 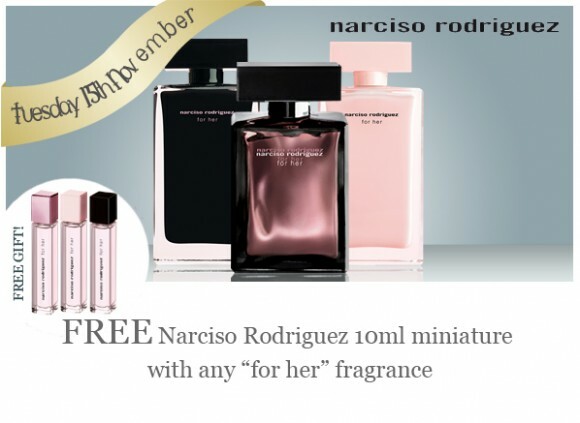 Experience the beautiful fragrance wherever you go with the Narciso Rodriguez For Her Fragrance Miniature, which you will receive for free with every purchase of any full-sized Narciso Rodriguez ‘For Her’ fragrance (including the Eau de Parfum, the Eau de Toilette, and the Eau de Parfum Intense). Lovely elegant exotic scent, very rare and unusual, would highly recommend! This entry was posted on Tuesday, November 15th, 2011 at 8:00 am and is filed under Christmas, Gifts, Offers. You can follow any responses to this entry through the RSS 2.0 feed. You can skip to the end and leave a response. Pinging is currently not allowed.